The below artworks are the most important by Constantin Brâncuși - that both overview the major creative periods, and highlight the greatest achievements by the artist. Artwork description & Analysis: Brâncuși's first version of The Kiss, marked a major departure from the emotive realism of Auguste Rodin's famous handling of the same subject. Its composition, texture, and material highlight Brâncuși's fascination with both the forms and spirituality of African, Assyrian, and Egyptian art. That attraction also led Brâncuși to craft The Kiss using direct carving, a technique that had become popular in France at the time due to an interest in "primitive" methods. These sculptures signify his shift toward simplified forms, as well as his interest in contrasting textures - both key aspects of his later work. Artwork description & Analysis: Portraits, heads, and busts were frequent subjects for Brâncuși, and he received several commissions for such work. With Sleeping Muse I, modeled on the Baroness Renee-Irana Frachon, Brâncuși developed a distinctive form of the portrait bust, representing only its sitter's disembodied head. This work was Brâncuși's first handling of the sleeping head, a thematic cycle that occupied the artist for roughly twenty years. The smoothness of the piece, achieved by the artist's practice of polishing the surface of his sculptures until they achieved a high gleam, contrasts with the carved definition of the sitter's facial features. Marble - Hirshhorn Museum and Sculpture Garden, Washington, D.C. Artwork description & Analysis: Originally created in 1918, in Endless Column Brâncuși references the axis mundi, or axis of the world, a concept crucial to the beliefs of many traditional cultures embodying the connection between heaven and earth. This focus reflected Brâncuși's strong and persistent affinity for the sacred, cosmic, and mythical. Endless Column also treats another theme of Brâncuși's work, the idea of infinity, here suggested by the repetition of identical rhomboid shapes. This image shows the most famous of Brâncuși's Endless Columns, which was the version that served as the centerpiece of the tripartite sculptural memorial to fallen soldiers in World War I erected in Tirgu-Jiu, Romania in 1938. Artwork description & Analysis: Romanian culture had a great influence on Brâncuși, particularly its woodcarving traditions and mystical folklore. Although he generally did not cite specific references for his works, The Sorceress, which was carved from a portion of a tree trunk where three branches met, is said to have been inspired by a flying witch from a Romanian folktale. He also drew on African tribal art for his woodcarvings, partially influenced by the example of Paul Gauguin. As with the present work, the base foundations were important elements of Brâncuși's sculptures; hand-carved by the artist, his bases were intended as artworks in their own right - a truly innovative concept in the history of sculpture, upending the centuries-old tradition of distinguishing between a sculptural artwork and the base on which it stands. Artwork description & Analysis: Animals, particularly those with transformative powers in myths, were a source of fascination for Brâncuși. He made numerous sculptures of fish, birds, seals, and swans. For his fish, rather than sculpting scales and fins, he endeavored to capture the animal's essential qualities - its "speed, its floating, flashing body seen through water... just the flash of its spirit." As in this piece, Brâncuși often juxtaposed diverse textures, colors, and forms, using media such as bronze, limestone, marble, and oak. The bronze fish sits on a wooden base, topped by a mirror, which functions as an integral part of the artwork itself - evoking the fish's habitat, a body of water, whose reflective quality reflects the sense of infinity Brâncuși often sought to capture in his work. The mirror-wood base also functions as structural support, as without it, the fish could not "stand" upright but would have to lay on its side. 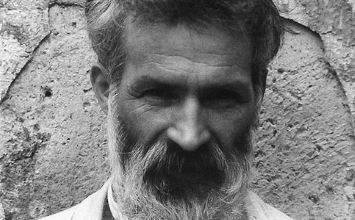 Artwork description & Analysis: Bird imagery constituted a major part of Brâncuși's work for much of his career. Beginning with his 1910 Maiastra sculptures, based on a magical bird from Romanian folklore, he proceeded to works such as Magic Bird and Golden Bird. However, it was his many variations of Bird in Space that comprised his best-known treatments of this theme. In these intensely polished works, Brâncuși dispenses with the bird's physical attributes, focusing instead on capturing "the essence of flight," through elongated, slightly tapering figures that suggest the bird's swift, upward movement. First published on 01 Jul 2009. Updated and modified regularly.